The housing market drop plummeted the value of my residence during the time I ventured back into the film and television industry. Instead of having $45K in equity, I was suddenly under water. If I sold my house, I’d still have to pay an additional $70K back to the bank. Unfortunately, I couldn’t make my mortgage payments and was forced to short sell my house to avoid bankruptcy. My developing stories weren’t ready to cash in, so finances got very tight. A little project here and there covered my minimum living expenses, but only because close friends and family invited me to dinner often. The generosity of others made a significant difference in my outlook, but I still had to face reality. If I was living within a tragic story, it was the perfect time for my car to breakdown, which it did. Being without a car in the Chicagoland area was a bizarre experience. Yes, there’s a lot of public transportation, but not at the times of day/night and locations that was necessary for my projects. The good news is that last week ended on a high note. The house sold and the banks waved the remaining debt – A miracle. I was able to walk away from the house without any baggage. As for the car, it went to the compactor and I was paid enough for scrap metal to cover the towing service that took the heap to the scrap pile – Another miracle. 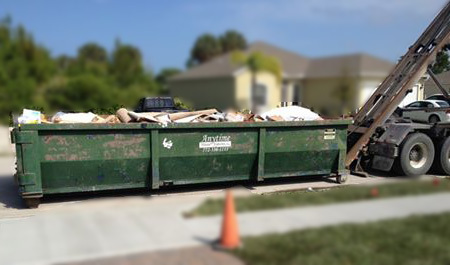 On the day I was moving out of the house, my helpers pointed out that I needed a 20 yard dumpster for all of the trash, the equivalent of a single car garage packed to the five-foot level. Unfortunately, there wasn’t a waste collector that could provide same day pick up service for under $700, until one person gave me the name and number of a waste collection driver. The man had time available during his lunch break and a 20 yard dumpster that was only 10-15% full, so he negotiated a cash deal for a third of what others had quoted. He swung by and a half hour later the garbage was gone – Miracle number three. Moving items into temporary storage was a stressful situation, as we had enough unloading to make our truck return an hour late, incurring overtime charges and penalties. But, miracle four showed up when the truck rental company called. They had just received an identical truck, which meant we could take the rest of the night to empty the vehicle without charge. There were three other miracles that I counted and I realized that just because a person is down on their luck or having a very bad year, doesn’t mean that someone isn’t watching out for them. Too often we see our circumstances as a thermometer of our physical, emotional, mental and spiritual condition, when in reality it’s just a measure of our circumstances. A smile comes to my face when I think back on all of the miracles from last week. The biggest miracle being friends and family who worked for hours helping me move a four bedroom house into two 10X10 storage units, not counting the trips to Goodwill and the dumpster. Those who stuck by my side and the list of miracles both help me to understand that my situation is not me, but only a temporary situation that touches me. I’m not a loser because of my losses, but rather a winner who had friends and family members prove their love through exceptional and humbling service. While I’d never want to put anyone through that turmoil again, I’m thankful for the faithful few that were there for me when I was overwhelmed. They’ve been endeared to me and etched into my heart. I hope to reciprocate with my service in the future, but if not, I’ll certainly pay it forward to others in need.